Facebook may be the $50B pound gorilla of social networks, but when it comes to search it’s just a toddler. I want to believe I know a thing or two about search by now, so let me explain why the above is terrible in a number of ways. In search, one party wants information. The other wants eyeballs. In advertising, one party has money. The other has product to sell. Why did Google get to dominate the world of online advertising? One word: relevance. If I search for something and the result is an ad, I may not perceive it as an ad if it’s exactly what I want. 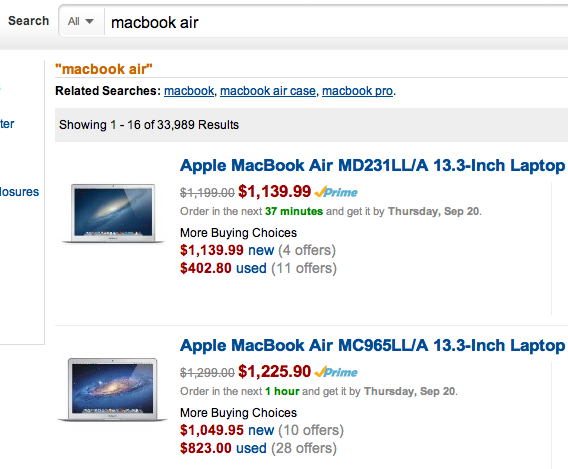 For example, I searched Amazon for “Macbook Air” just now. Would you say the results below are ads? Does the distinction even matter in this case? As a broker between two parties, your job is to make transactions more efficient. If Amazon tried desperately to sell me a Dell machine whenever I search for a Mac, they would be wasting my time. Presumably they would be wasting Dell’s money too, if Dell paid Amazon for this service. This is bad for me and Dell in the short run, and for Amazon in the long run: they might lose me as a customer and/or alienate Dell and Apple. So the question is: why did Facebook think it was a good idea to take Romney’s money and display his page as a sponsored result for the search Obama? I bet 99% of the people who type Obama DO NOT want to see Romney. I also think this is a waste of Romney’s money (which may be a good thing from my point of view, but this is irrelevant). I’ll attribute this to Facebook’s inexperience with sponsored search results. This is certainly not good for Facebook’s user experience, but they must have thought it was worth it to them because of the revenue. If so, that’s shortsighted. An honest broker would have told Romney’s staff that buying the word Obama was a poor use of their money. I assume they’d want to make them a happy customer: Romney may not be winning this election, but there can be no doubt that the GOP will be spending truckloads of money on advertising for the foreseeable future. Hacker News discussion for this post. Google eventually drops ads whose click-through rate (or maybe it’s expected revenue, taking bid into account) is too low, so irrelevant ads naturally drop out. I wonder if Facebook will do the same. IMHO the marketing strategy is to show the Obama’s voters another kind of political proposal (the Romney’s one). I remember the same issue in Adwords a few years ago, happening in the last argentinean presidential race… If you were searching for Hermes Binner, Adwords showed you the Cristina Fernandez ad. Google and Yahoo having the Obama campaign site as the #1 sponsored result for an Obama search proves that the campaign is smart enough to bid on it’s own search terms in order to push out other bidders. The fact that each campaign is the top sponsored listing for their own result (and that only 1 sponsored result is allowed) may mean that Google is preventing mudslinging ads from appearing, but it doesn’t make Google smarter than Facebook. Bidding on competitor’s names is a common search marketing tactic. In some cases it can be a highly effective strategy. In politics, that may not be the case, but just because it’s a bad idea in one instance doesn’t mean it’s a bad strategy overall. I would absolutely bid against competitors, particularly in situations where there may be a brand leader with more name recognition. If you search for Romney on Facebook, you get Paul Ryan, which says to me that the Romney-Ryan campaign is operating in a far more savvy capacity relative to Facebook. And this isn’t Republican fanboyism on my part – I will definitely not be voting for Romney in November, but kudos to his team for some smart marketing strategy. Assuming Romney is paying per click, the reverse-hack would be getting all Obama supports to tell everyone they know to click on Romney’s ad just to cost them money. God, US politics is sickening sometimes. Money is a unique variable because it subjects people to opportunity cost. The Internet has cultivated the “cult of free” as if something that has monetary cost associated with it is morally superior. The “next” web, X.0, is about making the Internet economically relevant to the individual. That means more P2P commerce innovation, not better search results. I would argue the advertising web, 2.0, hasn’t had a meaningful innovation since the mating of Adwords and PageRank a decade ago. Bitcoin is one example of this early evolution. It’s a non-corporate transaction tool, aka unit of exchange. Facebook has the potential to become a P2P intermediary, but they are betting on advertising. This is a horrible decision and invites a competitor to fill the market void. Twitter is irrelevant. G+ is irrelevant. 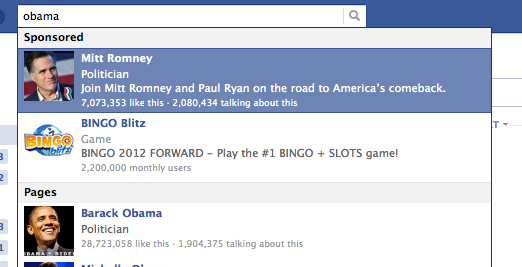 Facebook made a solid business move to allow the Romney camp to pay for top billing. If they interfere in the market for their product, paid result placement, they have no product. The Obama camp has plenty of money to pay up for it, but someone must have calculated that any loss of traffic on Facebook due to second tier placement doesn’t translate into meaningful vote slippage. Next PostNext I’ll Give MongoDB Another Try. In Ten Years.